As a professional speaker and workshop facilitator Bill has delivered more 5,000 hours of stand-up presentations across the U.S. and Canada. His presentations span a wide range of technical and generic, soft-skills and computer-skills, spiritual and vocational topics. 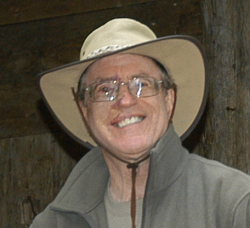 Bill’s job search adventure book series spans a wide range of audiences also, including; business and industry, college, military, and legal offenders. 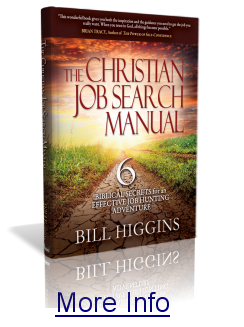 His original book, 6 Biblical Secrets for an Effective Job Search, has achieved numerous 5-star ratings on Amazon and other praiseworthy endorsements from such Christian leaders as Brian Tracy, Josh McDowell, Gene Getz, and Jon Gordon. In Bill’s newest book, Experience the Adventure, he explores the very foundation for the job searching adventure. In this new book Bill digs deeper into how the Master Author is writing each of our stories and how we can cooperate most fully with Him, find the meaning He has for us, and live the life of adventure He has in mind. This book paints the backdrop and rich colors of the “abundant life” Christ spoke of in John 10:10. Originally from Ohio, Bill spent four years in the U.S. Air Force, then went on to graduate from Biola University and Talbot Seminary. He has lived on the Monterey Peninsula, in the greater Los Angeles area, in Regina, Saskatchewan, Canada, and now in the Seattle area with his wife, Ann. Bill’s daughter and family live in the San Diego area and Ann’s three children all live in the Seattle area. To take advantage of numerous complementary resources click FREE Stuff on this website. 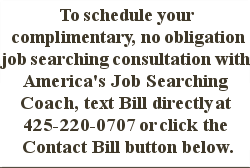 To schedule a complimentary, no obligation 60-90 minute job search consultation with America’s Job Searching Coach, simply text Bill directly at 425-220-0707, email at Bill@JobSearchingCoach.com, or you can click here to Contact Bill.